Stop and Smell the Chocolates: Cake Week Begins! Welcome to Cake Week! I'm so glad you're joining me - there's plenty of cake to share all week. If you have a spare 4 minutes, 43 seconds - watch my Cake Week Preview Video! If you think about it, it's just long enough to casually unwrap and eat a candy bar - so you could do that while you're watching and then you won't have wasted any time in your day! :) If you have any trouble watching it here, you can go watch it at newbaby.com. Stop by every day this week for a new cake recipe and picture. 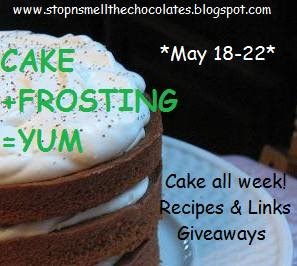 On Wednesday, you can link up your favorite cake recipes - from your archives or new! 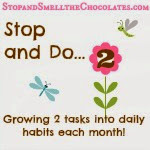 And on Friday, you can link up chocolate posts as usual. Oh, and there are giveaways of course! 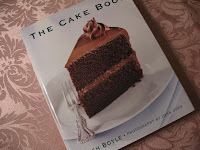 You could win this great cake recipe book! Lots of great recipes for you to try! 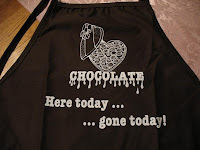 You could win a fabulous chocolate apron to wear while baking cakes! Check out my friend Kim modeling the one that she won! It's from An Occasional Chocolate - a chocolate supply company. Go check it out - lots of ideas on how you can make your own fabulous chocolate gifts, not to mention the cutest chocolate aprons! And I HAD to add a third prize because this was just so perfect! 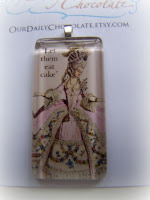 It's a glass tile charm pendant that says "Let them eat cake" from an Etsy shop - Our Daily Chocolate! Go take a look at all the cute and affordable things over there! 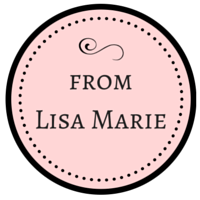 I read an interesting post recently by my friend Mel at A Box of Chocolates about giveaways and how complicated they're getting. Though I am a fan of the extra entries, I decided to keep this giveaway simple for a change of pace. So just leave a comment on this post to be entered! That's it! I'll keep the giveaways open through Sunday 5/24 and will announce 3 random winners the following week. Before we move along to today's cake recipe, I want to let you know that after you get your piece of cake, you will want to head out to a big party! I am happy to provide the cake for Like a Warm Cup of Cofffee's 1-Year Blogaversary Party! It's a huge party - lots of fun and fabulous giveaways! Stop by and say hi to Sarah Mae (finish chewing your bite of cake first though). OK, on to the cake! 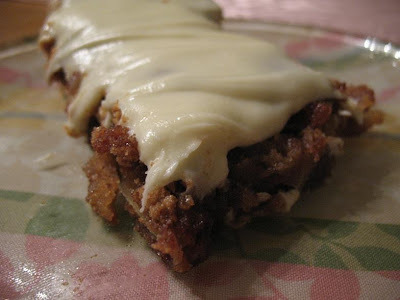 Today's recipe is one of my family's favorites. I got the recipe from a co-worker years ago when she brought the cake to a potluck. I was hooked! I think you'll love it too - so moist and how can you possibly go wrong with a cream cheese frosting?? Mix ingredients together and put into a greased 9x13 pan. Heat oven to 325 degrees F for a glass pan or 350 for a metal pan. Bake for 45 minutes to 1 hour - toothpick should come out clean. Cool and frost. Frost cake. Store in refrigerator. I hope you enjoyed the first day of Cake Week!! Let me know what you think, comment to enter the giveaways, head out to another party, and come back tomorrow for more delicious cake! You,my friend, are too cute! That cake looks delicious and I want another chocolate apron! LOL. Big massive amount of cake pans size hugs to you! That cake does look delicious! I'm looking forward to the fun of Cake Week. I've got a chocolate cake recipe to link up on Wednesday, too. Hey there my friend! This recipe sounds delicious! My husband will love it. I would love to be entered for the giveaway. They all sound like great prizes! 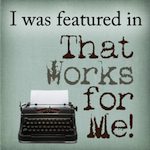 I did give you a mention on my blog this morning. But I do appreciate the one entry. All of the others can get very confusing...and time consuming. Have a great Cake Week my friend! Whoo hoo! Here's to great giveaways and CAKE!!! It just so happens that someone gave me a whole case of apples...now I know what to do with them! Come next week, I'll be knee deep in not one, but two birthday cakes. So cake week couldn't have come at a more appropriate time. Looking forward to it. Count me in! I hope I win! What a great video! So fun to watch! Definitely makes me want to come back. I especially don't want to miss Friday. That looks so good!! Yummo!! German apple cake *smile* I will give this recipe a try but , hope you don’t mind, will leave out the frosting. Over here in German we usually do not have your kind of frosting on our cakes - I love my apple cake with lots of crumbles. I’m looking forward to more recipes. The cake looks divine!!! What a great recipe. I'll be following you now! All the Pied Piper needed was chocolate!!! I am looking foward to your cake recipes this week. I am with you I love a good cream cheese frosting. Oh Lisa, your video is just too cute. It appears you have put a LOT of work into making your video so i can on imagen what you have done to prepare us for the rest of the week. If you wrote a script, you did GREAT. You caught my attention and kept it the whole 4+ minutes, I love your smile, your voice, everything was great. I know I am not suppose to critique your video, but I just had to tell you how impressed I am. Your flow was smooth, no stall words, no stuttering, are you a pro and just have not told us??? Are you a news reporter? Well I could smell the cakes from there...thanks for putting so much effort into your blog. Here's to a WONDERFUL week. That frosting makes it look soo good! Do we really have to share this week?? Ha! OHG That cake looks so yummy!! and I love the cupcakes in a cone idea you did for Wednesday (might use that for my daughter's birthday)! !